We offer many auto repair and maintenance services for your convenience. You can always count on us to provide you with 24/7 emergency towing. Extend the longevity of your vehicle with our tire rotation services. 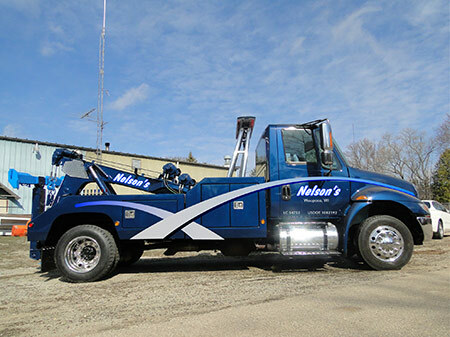 Nelson’s Sales & Service is the first and only call you’ll need to make for towing and auto repair in Wisconsin. Call us for our quick 24-hour service when you’re in a jam! We offer towing/recovery for all sizes of vehicles, including semi-trucks. Our facility also has its own used auto lot, with a great selection of used cars at affordable prices. Need a tow or emergency auto repair in Waupaca, WI? Since 1981, Nelson’s Sales & Service has been offering auto repair work and towing/recovery at great rates. Getting the job done right the first time, at an honest and affordable price, with minimal headaches and hassle is our steadfast commitment to you. We have a fleet of tow trucks to meet all your recovery needs, from standard cars to semis. Our vehicles include a traditional wrecker, flatbed trailer and a heavy-duty tow truck for the big jobs. We will pick up and tow anywhere in the state. At Nelson’s Sales & Service, we also offer a great selection of used cars to choose from, priced to sell. Find a reliable set of wheels at affordable prices in our lot. Be sure to stop by and check us out for the best selection of used cars in the area! Our dedication to the services we offer hasn’t changed, and that’s why we’re still the premier source for auto repair in Waupaca, WI after more than 30 years in business. So, whether you’re stuck in a snowbank 100 miles away or broken down just a few miles from our shop, we encourage you to call us the next time you’re in need. Our towing, sales and car repair in Waupaca, WI can’t be beat! Our business is locally-owned and -operated, established in 1981. We will pick up and tow anywhere in Wisconsin! Our fleet includes vehicles to accommodate any type of tow, from cars to semis. We also offer a great selection of used cars on our lot, for interested buyers. Our repair expertise is second to none! We’ll get you back on the road in no time at all. For general towing or auto services, contact Nelson’s Sales & Service for a pick-up, a work estimate or to schedule service. We’ll respond quickly and provide you with unparalleled results.